A documentary, directed by Wim Wenders and Juliano Ribeiro Salgado, about capturing humanity. 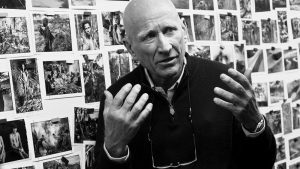 The Salt of the Earth follows the career of photographer and ethnologist Sebastião Salgado, whose photos depict the vanishing lifestyles of the world’s indigenous people. Wenders brings “an outsider’s view” to a wealth of extant footage and photos and Salgado proves an adept and compassionate storyteller The Salt of the Earth was nominated for an Oscar in 2015.